The vehicle Compass Module features a built-in two-axis magnetic sensor. Heading data from 0 to 359 degrees is broadcast over the J1939 CAN or J1587 data bus. An advanced, built-in calibration routine compensates for local magnetic field distortions, such as speaker magnets, vehicle chassis, and proximity to high current conductors. Its packaging is designed to withstand the harsh conditions encountered in the heavy-vehicle and construction industries. Designed to withstand the harsh conditions encountered in the heavy vehicle and construction industries, the Compass Module incorporates the same, field-proven package design found in other AMETEK vehicular interface modules. 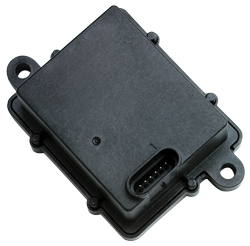 The module meets all SAE J1455 and J1113 vehicular requirements and contains one six-pin, self-locking, Packard MetriPack® connector in a compact, environmentally sealed, polymer package. An advanced, built-in calibration routine compensates for local magnetic field distortions such as speaker magnets, vehicle chassis, and proximity to high current conductors. The module accepts a declination angle input to provide a true geographic north heading, and the module can be mounted upright, upside down and parallel or at right angle to forward direction of travel.